The kitchen is an important part of the house, where not only cooking takes place, but also family meetings, reception of guests or just rest. Especially many functions this room performs in apartments with small footage. Therefore, the kitchen should carry an atmosphere of comfort, peace, and harmony. It should be a pleasure to be for everyone, which means that skillfully choosing kitchen classic curtains is the responsibility of every good housewife. How to choose classic curtains for a kitchen? Location of the window opening. 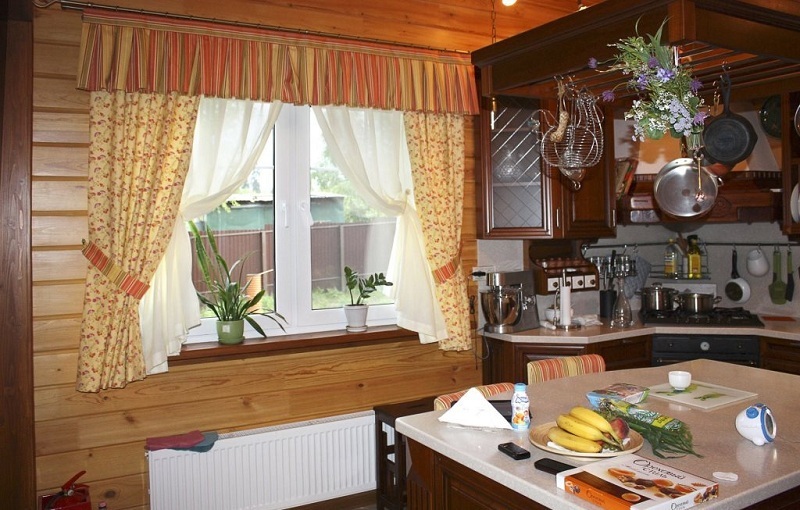 For a kitchen with a small meter and a low ceiling, it is better to choose curtains from light, not very dense fabrics. You should not choose a model with decor or pattern – it is desirable to choose monochrome options. Prefer pastel shades of a cold gamut. It is better to buy curtains 0.5 m wider than the window opening (in this case, the curtains will “protrude” on each side by 25 cm). This way you can visually increase the kitchen space. And so that the kitchen seemed higher than it actually is, the eaves should be installed as close as possible to the ceiling. If you are a happy owner of a spacious kitchen, you can choose curtains of a darker scale with decorations in the form of lambrequins, grabs, etc. At the same time, the width of the curtains should be equal to the width of the window opening. If you want to choose the curtains for the kitchen to match the furniture or walls, then choose models a couple of shades lighter or darker. We also allow the option with a combination of tones (tulle – in the tone of furniture, curtains – in the tone of the walls, or vice versa). Forms – the correct, clear. The decor is discreet. Colors – pastel. 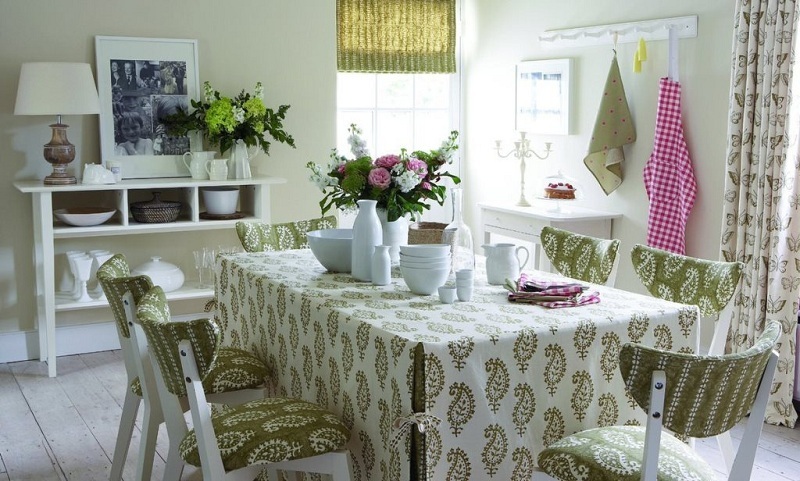 Also to the classic kitchen fit curtains brown, green, black, white, beige, golden shades. In no case do not use too bright, and especially acid colors. Fabrics – silk, satin, velor, jacquard, velvet, shinil, brocade. In addition to the usual models, on the market today, there are new items such as roller blinds, Roman curtains. However, the most popular are still options from textiles. The standard option is a combination of light tulle and thick curtains on the sides of the window. The bottom of the curtains may have smooth or wavy edges. Pelmets can be made from both hard and soft enough fabric. Holders are often decorated with gilt, fringe, and other decorative elements. The main thing is that the whole composition should look harmonious and echo the overall interior. Drapery is an important component on which it depends on how authentic the curtains will look in a classic kitchen. You must carefully consider the quality of the material, as well as select the correct width. It will be great if you buy a canvas twice as wide as a cornice. 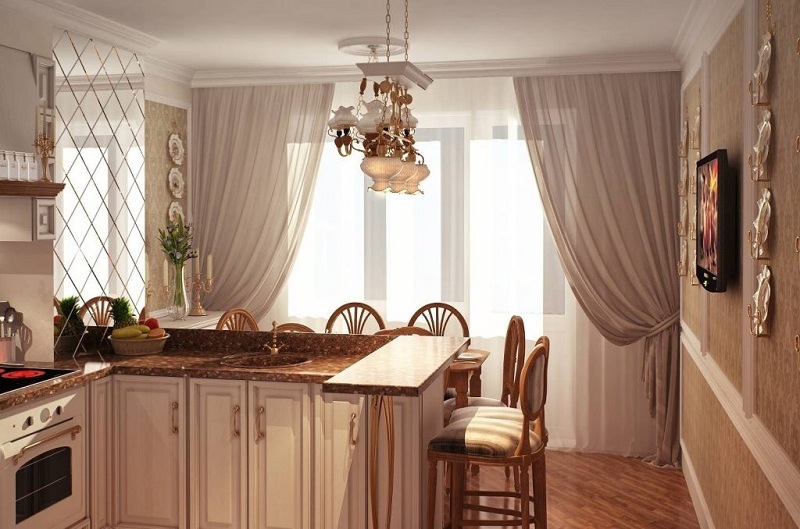 For the kitchen in the style of “classic” is also suitable for so-called French curtains. Usually, they are light, translucent. When sewing these materials are used such as organza, moire, polyester. According to the color palette, a combination of two similar light shades is possible (for example, cream and “coffee with milk”). It is also appropriate dense curtains and decorative elements, represented by lambrequins with tassels or fringe. Curtain length – to the window sill or to the floor. Another option for the design of the window in the classical style – Austrian curtains. Just like the French, they are made of light fabrics, have horizontal folds. But along the edges, they often have additional decoration in the form of radiation folds, fringes, and edging. Austrian blinds are often decorated with a floral print. In addition to this, you can also choose curtains with holders. One of the modern approaches to window decoration is the use of roller blinds. Such curtains are a fabric that is wound on a shaft. When closed, the roll is hidden in the box. Roll curtains can have both mechanical and remote control systems. Some models are equipped with a day-night mechanism when the curtain contains two types of fabric, differing in density. This allows you to control the degree of illumination of the kitchen. There is a cassette type of roll curtains. They are installed on the window frame itself, which is convenient when opening the shutters. In the kitchen space, this is especially true. A functional option that has expanded the ideas of design for the kitchen – Roman curtains. This model is a strip of smooth fabric, which, when opened, form horizontal folds. 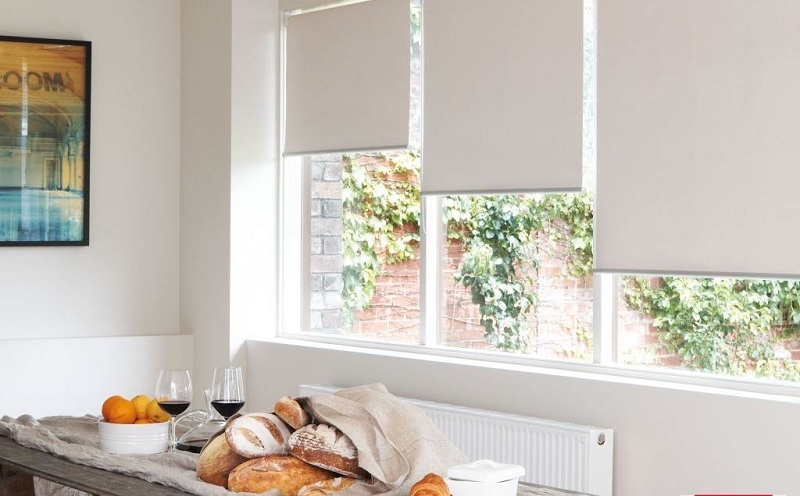 Cascade variety of Roman blinds retains folds and with a fully expanded canvas. Curtains of this kind do not tolerate any additions in the form of curtains or curtains. 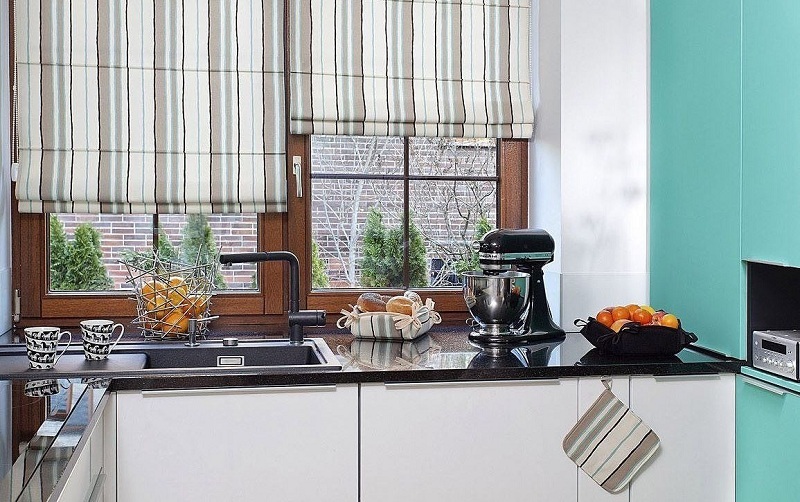 If you chose this window design for a classic kitchen, then remember one thing: Roman curtains are not only functional and practical but also self-sufficient. 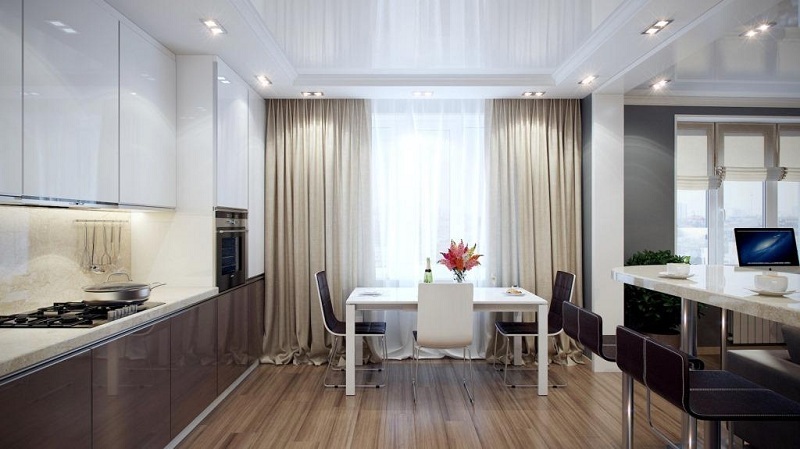 If your kitchen is spacious, large window opening, good lighting, you can consider the option with Japanese curtains. This is a new approach to design and functionality: they can be controlled not only manually and by rope, but also electrically. Japanese models are several textile panels, moving along special multi-layer eaves. Such a modern model will not only fit into the calm interior of the kitchen but will not require special attention to itself in terms of care. Japanese curtains are practical, easy to use. Whichever curtain design option you choose, remember that curtains should complement the interior, and not argue with it. 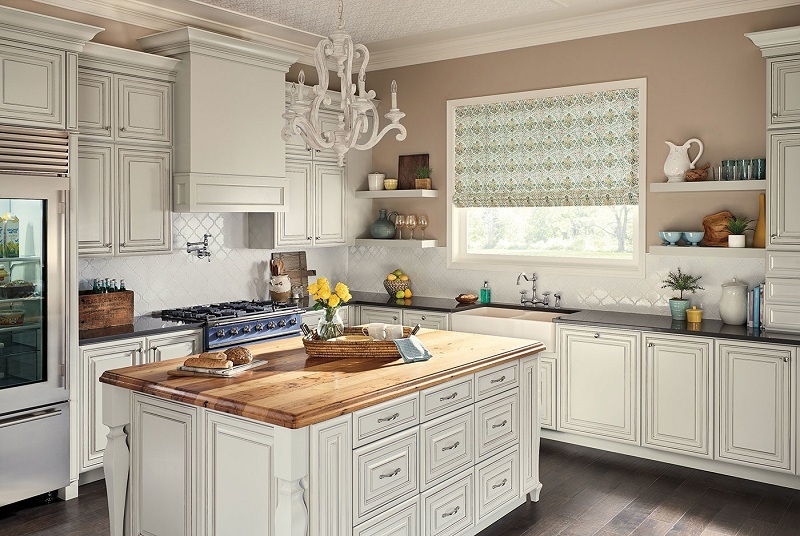 In the relaxed atmosphere of a classic kitchen requires the same nature of the curtains. And what they will be – textile, roll, Roman or Japanese – it’s up to you.